For other uses, see Formby (disambiguation). Formby is a civil parish and town in the Metropolitan Borough of Sefton, Merseyside, England, which had a population of 22,419 at the 2011 Census. Historically in Lancashire, three manors are recorded in the Domesday Book under "Fornebei", Halsall, Walton and Poynton. Cockle raking and shrimp fishing lasted into the 19th century. By 1872, the township and sub-district was made up of two chapelries (St. Peter and St. Luke), Birkdale township, the hamlets of Ainsdale and Raven-Meols and Altcar parish. Formby was built on the plain adjoining the Irish Sea coast a few miles north of the Crosby channel. A commuter town for Liverpool, it is also a popular tourist destination in the summer months, with day trippers attracted to its beaches, sand dunes and wildlife, particularly the endangered red squirrel and natterjack toad. The area is conserved by the National Trust, and designated a Site of Special Scientific Interest. Erosion of sand on the beach at Formby is revealing layers of mud and sediment, laid down in the late Mesolithic to the late Neolithic, approximately 8,000 – 5,000 years ago, and covered in the early Bronze Age. These sediments often contain the footprints of humans and animals (red deer, roe deer, wild boar, wolf, aurochs) and birds (oystercatcher, crane and other waders) from that period. In June 2016, over 50 human footprints from 7,000 years ago were uncovered on the beach. The common place-name suffix -by is from the Scandinavian byr meaning "homestead", "settlement" or "village". The village of Formby was originally spelt Fornebei and means "the old settlement" or "village belonging to Forni". At that time Fornibiyum was also a well-known Norse family name. He could have been the leader of the invading expedition which took possession of this coast. Until its closure in 1998, Oslo Airport in Norway was situated in a town called Fornebu. It was from Ireland in about 960 AD that these Norsemen or Vikings first came to the west coast of Lancashire, initially trading or raiding and then settling. Tradition says that the Viking invaders failed to defeat the native Anglo-Saxons on the coast of Formby, so they sailed inland, up the River Alt, and attacked from the rear. Dangus Lane, on the east side of the village, is sometimes called Danesgate Land, being connected by local traditions with this incursion. Formby Hall is a Grade II listed building dating back to 1223. It has traditionally been the home of the lords of the manor. Much of the land around it is now a golf course. Formby Beach is the location of the first lifeboat station in the UK. It is believed to have been established as early as 1776 by William Hutchinson, the Dock Master for the Liverpool Common Council. Although no exact record has been found, the boat used is believed to have been a 'Mersey Gig'. The last launch from the station took place in 1916. Remarkably, a film of this event survived. The foundations of the last of the lifeboat station buildings remain on the beach to this day. In 2016, the newly opened Wetherspoons pub in the town was named 'The Lifeboat' in honour of the original lifeboat station. Formby is home to RAF Woodvale, a small RAF station on the outskirts of the town. The airfield opened in 1941 and is a former Second World War fighter station with three active runways, the main runway being a mile in length. Today it is used by RAF for light aircraft and fighter training, as well as a few civilian aircraft. The station was also home to Merseyside Police's helicopter, known as 'Mike One'. The RAF station was also home to the last ever operational service of WWII fighter plane the Supermarine Spitfire. In 1957 the last Spitfire to fly operationally with British military markings took off from RAF Woodvale. Woodvale is also home to the Woodvale Rally, one of the biggest shows on an active MOD station in the North West. Holy Trinity Church is believed to be the only church in the country which holds a special service in which seasonal greenery collected by the menfolk of the parish and then twined into wreaths by the ladies is lifted into place as part of a service of worship in the run-up to Christmas. Until 1974, Formby was an urban district (Formby Urban District) within the administrative county of Lancashire. 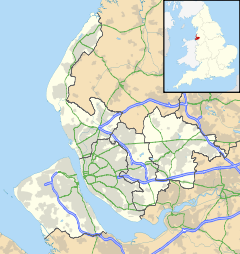 Since 1 April 1974, it has formed part of the Metropolitan Borough of Sefton, in Merseyside. Prior to 1983 Formby was in the parliamentary constituency of Ormskirk and after Ormskirk's abolition was made part of the Crosby constituency. The MP for Crosby from 1997 until 2010 was Claire Curtis-Thomas, a member of the Labour Party, prior to her election the seat was generally considered to be a safe Conservative Party stronghold with Tory MPs elected at every election barring the Crosby by-election, 1981 where Shirley Williams of the Social Democratic Party was elected to represent the constituency. As a result of the Crosby constituency being abolished for the 2010 general election, Formby is part of the newly created Sefton Central constituency represented by Bill Esterson, a member of the Labour Party. For elections to Sefton Council, Formby is divided between two electoral wards with three councillors each. Harington ward, whose councillors are Denise Dutton (Conservative Party), Simon Jamieson (Conservative Party) and Michael Pitt (Conservative Party), and Ravenmeols ward, whose councillors are Catie Page (Labour Party), Nina Killen (Labour Party) and Bob McCann (Formby Residents Action Group). Formby is a coastal town roughly 7 sq miles (17 km²) in the borough of Sefton. The town is built upon the west of a large flat area of land called the West Lancashire Coastal Plain. Formby's highest point is within the sand dunes that separate the Irish Sea from Formby, sand dunes are ever changing in shape and formation so there is no fixed point. The River Alt runs into the Irish Sea just south of Formby at Hightown. The town is rurally landlocked; the land between Formby and the areas of Southport, Ormskirk and Liverpool is green belt land and is used for arable agricultural purposes. The areas around the urban fringe are drained by irrigation ditches and open areas get boggy in the winter months. Earth in urban areas is well drained, very loose and sandy. The section of land between Formby and the coast is varied in vegetation, wildlife and terrain. This area includes pine forests: natural and man-made, sand dunes, marram grass, deciduous woodland, seasonal ponds and lakes. Large areas of this land are protected by the National Trust. Formby is in a temperate climate zone, with mild winters and warm summers. Formby's coastline faces an ongoing threat from water-based erosion, with high tides washing away yards of sand dunes. In an attempt to stem this, in some years discarded Christmas trees are collected and planted by rangers to help slow this effect. The main shopping area is known locally as 'The Village'. Here, the town upholds an array of shops including a Boots, a Card Factory and a Marks and Spencer, alongside some independent outlets. These shops are located along the streets of Chapel Lane and Brows Lane, which also include a number of coffee houses, including Costa Coffee and Cafe Nero. The tree-lined Avenue runs for about a third of a mile, with shops either side for 325 yards of it. There are several other smaller shopping areas around Formby and Freshfield, mostly convenience stores and some specialist outlets, such as an independent optician and a model shop. Formby also has a main post office and two smaller post offices. The town has several supermarkets including a Tesco, Marks & Spencer's SimplyFood, a Waitrose and an Iceland. Formby has no major industries; however, there is a small industrial estate on the outskirts of the town. Recent studies into the town show that between 10%-30% of its residents commute to Liverpool. Formby has a significant tourist industry, most notably between the warmer months of May and September. In particular, it is popular with day trippers from Liverpool and other industrial towns in Merseyside and West Lancashire. There are two main spots along the Formby Coast which are particularly popular with the public. The Lifeboat Road site is about 1½ miles from the town centre; there are three linked unpaved car parks with several routes cascading out into the sand dunes and woods. The car parks are about 900 yards from the beach. Victoria Road is north of Lifeboat Road and is busier due to the red squirrel reserve being located here, as well as it being the starting point for the asparagus trail. The reserve begins at the junction of Larkhill Lane and Victoria Road. There is a charge to park from this point onwards. Parking is available adjacent to the reserve and at the end of the road, there is a large unpaved car park for easier beach access. The beach is located approximately 100 yards from the car park. There is a privately run caravan park called Formby Point Caravan Park on Lifeboat Road, open between March and October. There are around 300 caravans on the park and 20 plots for touring caravans. There is a phone box, public toilet and a play area on site and, until 1995, there was a small convenience store. Additionally, there is a smaller caravan site called Freshfield Caravan Park. Formby Bypass (A565) was built over fifty years ago to take the major Liverpool to Southport route out of Formby and cut alongside the fringe of the town. The bypass is a dual carriageway with two roundabouts and two sets of traffic lights. It has been the scene of many accidents, some fatal and there are calls from some for the scrapping of a proposed motorway link as a result. The B5195 links Formby with Ormskirk and Maghull. Motorways are easily accessible, the M58 and M57 are both 6 miles from Formby. With the town's major growth period around the early 20th century and Formby never really having any major industry, the road system followed an American style method of road building. Major roads in the town are wide and in an almost block formation with housing estates being built into those blocks. There are two railway stations: Formby railway station and, less than a mile north, Freshfield railway station. Both are on the Northern Line of the Merseyrail network, which runs from Liverpool to Southport. Trains are frequent (typically every 15 minutes) and are a popular way of commuting, especially to the city centre. Bus services in the town are provided by Arriva North West, Stagecoach Merseyside and Merseytravel. These include services to Southport, Ince Blundell, Liverpool, Southport and Formby District Hospital and Merseytravel's Formby circular routes. The nearest airport is in Liverpool which is 25 miles away. Manchester Airport seconds that, 43 miles away. Liverpool Airport is reachable using Liverpool's suburban railway network, Merseyrail. London is under two hours away via train from Runcorn railway station which is 25 miles / 45 minutes drive from Formby, or from Liverpool Lime Street railway station which is 13 miles / 33 minutes drive. In addition to motorised transport, Formby is served by excellent cycle routes, mainly centring on the pinewoods along the coast leading to both Southport and Liverpool. There are also many cycle lanes on the roads leading to the larger conurbations to the north and south. There are seven primary schools in Formby: Woodlands, Redgate CP, Our Lady of Compassion RC, St Jerome's RC, Trinity St Peters C. of E., Freshfield CP and St Luke's C. of E.. Trinity St Peter's C. of E. in Formby is the amalgamation of two former primary schools – St Peter's and Holy Trinity – the latter of which closed in July 2006. The school was formed as part of a major reorganisation of primary education in Sefton. Raven Meols Primary School also closed as a school and is now used as a Community Centre. Formby has two large high schools, Formby High School and Range High School, both schools are high performers: The Liverpool Echo rated the two schools as the best state schools in Sefton, with Formby High School narrowly beating its neighbour. Formby also had an independent high school, Clarence High, but it closed in 2018. Clarence High was owned by Nugent, a registered charity, who also governs Clumber Lodge, a children's home in Formby. Formby has a long tradition of scouting which began in the town in 1909. This was just over a year after Baden Powell's legendary experimental camp on Brownsea Island in 1907. The first group aptly named the 1st Formby was set up at Holy Trinity Church Hall by Mr Murray Spense. There are currently six active groups out of the nine that were set up over the last century, especially since the 1960s housing estates expanded the town. Scouting still thrives in Formby today, recently celebrating Scouting's centenary with a march to the beach and an outdoor ceremony. Scouts can be seen marching through the village every year on St George's Day. To the west of the town lie pinewoods and sand dunes. The whole of the coastline here is managed as a Special Area of Conservation (SAC) for its important wildlife reserves by Sefton Coast Partnership. The pine woods at Victoria Road have been established as a National Trust reserve for the red squirrel, listed on the endangered species list. Formby is one of several sites in Britain where the red squirrel can still be found although it is now being threatened by the grey squirrel. Formby is also notable for the presence of natterjack toads. Formby is only one of a few sites in England where they will breed. Later in the evening the male's distinctive song can be heard and is known locally as the 'Bootle Organ'. In spring the males gather at the edge of shallow pools in the dune slacks and sing to attract a mate. This stretch of coast is famous for links golf courses such as Southport & Ainsdale, Hillside, West Lancashire, Hesketh and Royal Birkdale. Formby is home to another championship quality golf course -- Formby Golf Club. However, the club, unlike its neighbour Royal Birkdale, does not have the capacity to host large events such as The Open Championship. Formby has a cricket club based down Cricket Path in Freshfield that plays in the Liverpool and District Cricket Competition; this also has squash courts and a large AstroTurf hockey pitch. The town also had a football team called Formby F.C. who played in the North West Counties Football League First Division. They played at Altcar Road, behind Tesco just off the A565 Formby Bypass, having moved in the summer of 2002 from their town centre home at Brows Lane. That site is now occupied by Formby Pool which opened on 27 January 2007. The biggest game in the club's history was in November 1973 when they faced Oldham Athletic in the First Round of the F.A Cup. In addition, a variety of youth sporting groups are based in Formby. These include Formby Junior Sports Club (FJSC) known locally as "Rourke's League" after Jim Rourke MBE (1912–2006) who founded the club on 2 January 1959. Jim continued to attend the club into his 90s. Over 600 children ranging in age from 5 to 16 years meet at Deansgate Lane Playing Fields to play football at various times throughout Saturday mornings during the football season. The club welcomes children of all abilities, there are no trials or criteria to meet; every member plays every week. The club also fields numerous representative teams in local junior leagues (e.g. the Craven Minor League). Formby is also home to Formby Dons Football Club, who operate 3 teams, playing their home games at Duke Street Park. In 2007, Formby Vikings Rugby Union Team was established to include a wide range of ages including a colts first 15 team. Formby has a number of pubs as well as two social clubs, the Gild Hall and the Formby Club. There are also various restaurants and bars , a number of takeaways and other businesses. The notable music hall entertainer George Formby, Sr. adopted his stage name when he was waiting for a train and saw a goods train on its way to Formby. His son George Formby, Jr. used the same stage name. ^ The Boundary Committee for England (BCFE) began reviewing the electoral arrangements of Sefton on 4 December 2001. ^ "Parish population 2011". Retrieved 1 June 2015. ^ a b c d e Farrer, William; Brownbill, J (1907). A History of the County of Lancaster: Volume 3. Victoria County History. pp. 45–52. The Section dedicated to Formby. ^ Wilson, John Marius (1874). Imperial Gazetteer of England and Wales (1870-1872). A. Fullarton & Co.
^ a b "City Relationships: Economic Linkages in Northern city regions. Liverpool City Region" (PDF). Archived from the original (PDF) on 7 April 2012. ^ "Sefton Council Core Strategy Options Paper May 2011. Profile of Sefton" (PDF). Archived from the original (PDF) on 2 April 2012. ^ Carolyn Garlick. "Formby coastal walk". BBC.co.uk. ^ "Formby, Ainsdale & Birkdale - Inspector Jim Atherton profile". Merseyside Police. ^ "Formby". The National Trust. Archived from the original on 2 October 2011. ^ Roberts, Gordon (2009). "Ephemeral, sub-fossil mammalian, avian and Hominid Footprints within Flandrian Sediment Exposures at Formby Point, Sefton Coast, North West England. Taylor and Francis Group". Ichnos. 16 (1–2): 33–48. doi:10.1080/10420940802470730. ^ Smith, Philip H. (1999). The Sands of Time: an introduction to the Sand Dunes of the Sefton Coast. National Museums and Galleries on Merseyside. ISBN 1-902700-03-1. ^ Bishop, Rachel (19 June 2016). "Thousands of prehistoric footprints from 7,000 years ago found on UK beach". ^ Harding, Stephen (2002). Viking Mersey: Scandinavian Wirral, West Lancashire and Chester. Countyvise. ISBN 1-901231-34-8. ^ "Viking Life". Southport.tv. Retrieved 1 December 2015. ^ Yorke, Barbara & Reginald. Britain's First Lifeboat Station, Formby, 1776 - 1918. Alt Press. ISBN 0-9508155-0-0. ^ Halley, James J. (1988). The Squadrons of the Royal Air Force 1918-1988. Tonbridge: Air Britain (Historians) Ltd. ISBN 0-85130-164-9. ^ a b "Merseyside Regional History Section - RAF Woodvale". Mersey Reporter. Retrieved 1 December 2015. ^ "About US: Departments". Merseyside Police. Archived from the original on 16 October 2008. ^ "Merseyside Police Authority". Aeroflight. Retrieved 1 December 2015. ^ "A Fantastic Weekend For ALL The Family!". Woodvale Rally. Archived from the original on 15 September 2008. Retrieved 13 December 2011. ^ Smith, Philip H. (1999). The Sands of Times, an introduction to the Sand Dunes of the Sefton Coast Line. Liverpool: National Museums and Galleries on Merseyside. ISBN 1-902700-03-1. ^ Brown, Andrew (26 December 2014). "Christmas tree recycling in Southport & Formby - Sefton Council offers free collection service". Southport Visiter. Retrieved 30 November 2015. ^ "Sefton Coastal Footpath". BBC Online. 19 August 2005. Retrieved 30 November 2015. ^ "Schools Web Directory UK - Search Schools by LEA". www.schoolswebdirectory.co.uk. ^ "Formby". The National Trust. Archived from the original on 1 March 2009. ^ "North Merseyside Biodiversity Action Plan - Red Squirrel". Merseyside Biodiversity Group. Archived from the original on 3 March 2016. Retrieved 30 November 2015. ^ Country File. 28 August 2008. BBC. ^ Simpson, David (Summer 1997). "The Natterjack Toad". Sefton Coast Partnership. Archived from the original on 29 August 2008. ^ "Curtis Cup 2004 Formby". Southport Reporter. 12 June 2004. Archived from the original on 16 July 2011. ^ "Courses". England's Golf Coast. Retrieved 30 November 2015. ^ "Formby Loses Favourite Father Figure, Jim Rourke MBE, 1912 - 2006". Southport Reporter. 13 February 2006. Retrieved 30 November 2015. ^ Kirkbride, Philip (21 January 2009). "FJSC celebrates its 50th anniversary this month. Phil Kirkbride looks back". Formby Times. Archived from the original on 23 January 2009. ^ "Junior Jim a real marvel". Liverpool Echo. 17 September 2004. Retrieved 30 November 2015. ^ "Rodgers focused on foundations". Liverpool FC. Archived from the original on 15 July 2012. ^ Kelly, Joanne (28 September 2007). "Carnival time at opening of Blues star's Birkdale bar". Southport Visiter. Archived from the original on 16 July 2011. ^ "Are ye right there, Michael?". St Luke's Church. Archived from the original on 11 June 2011. ^ "Cringing Cult of Celebrity in Formby, Merseyside". The Knowhere Guide. Archived from the original on 20 April 2009. ^ "George Formby Senior - Entertainer". BBC Online. Retrieved 30 November 2015. Wikimedia Commons has media related to Formby. Wikivoyage has a travel guide for Formby. Photos of St. Michael Church just outside Formby in Great Altcar.